Northlight Studio occupies a former butcher’s shop half way down Stromness Street and is home to Ros Bryant who works in woven tapestry and stone letter carving. The gallery has shown the work of several other local and visiting artists and is a busy venue for courses in tapestry weaving and stone letter carving. 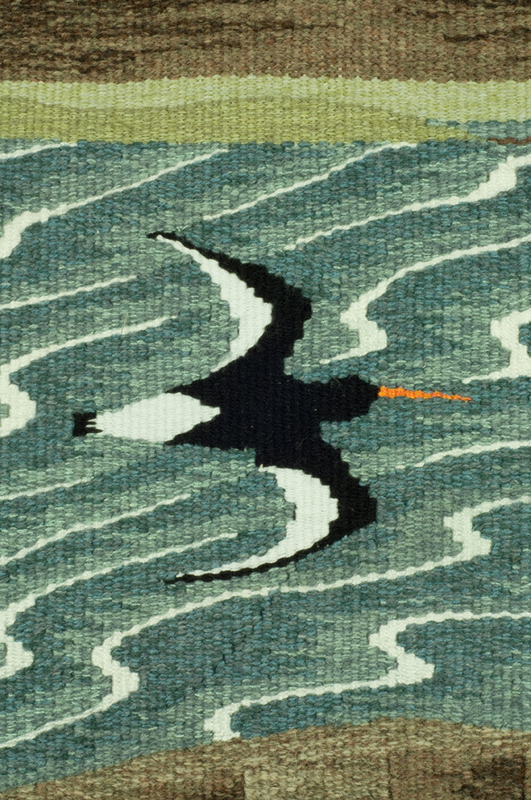 Janet Clark, who shares this September’s exhibition, has been a regular visitor to Orkney, taught courses at Northlight and is involved in an exchange project between weavers in Orkney, Yorkshire, Denmark and Belfast. 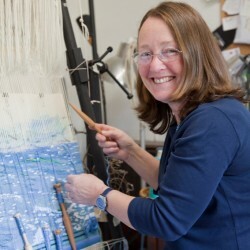 Janet is based in West Yorkshire where she and Ros both originate and where they first learned tapestry together. 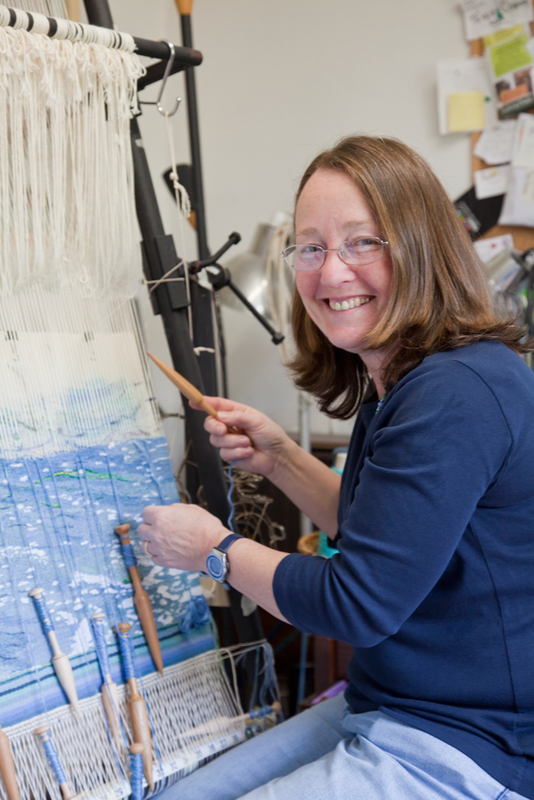 For Janet and Ros, making tapestry has become a way of life, a second career. 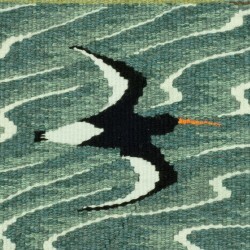 They worked closely together on hosting a major exhibition of contemporary tapestry in 2008 and establishing the British Tapestry Group which now has a continually growing membership – www.thebritishtapestrygroup.co.uk . Ros’ work is very often about the sea, which in contrast to the landlocked solidity of her native Pennine industrial landscape provides endless fascination. Tending towards a gentle palette, her work often expresses the quietness and sense of space she finds in the Orkney landscape. 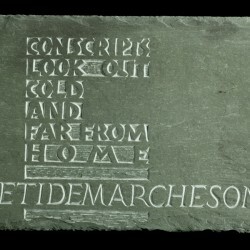 Stone carving is a more recent, second medium. Ros often works on beach stones, using the character which each stone already possesses. She also makes commissioned stone pieces, particularly of more informal memorial stones. 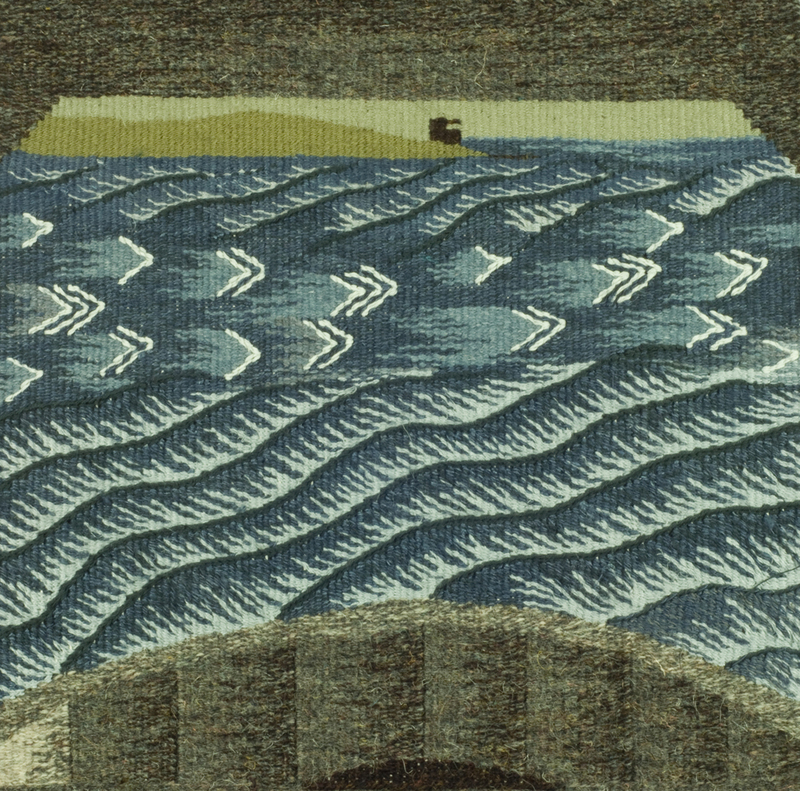 Central to my contribution to September’s exhibition ‘Between Tides’ will be a series of 8 tapestries with corresponding stone pieces entitled Sea Roads. This project began in March during a week of equinoctial Spring Tides. For eight consecutive days, I went around noon to the West Shore to make observation of the tide in Hoy Sound. The weather obliged me by ranging from balmy to a vicious sleet laden gale during which I took shelter in a wartime gun emplacement. “I have a strong affinity with the idea of wilderness and treasure those places we have not yet been able to colonize. It was a surprise then to find myself engaged with the human traffic in and around Hoy Sound. Each day I made colour studies, rough pen and pencil sketches, photos (which I’ve barely opened since), noted state of tide, wind and light and wrote scratchy haikus, all aimed at capturing whatever was happening at the time. My gun emplacement shelter became a part of the observation – though I must admit to having retreated on some days to the back of my wee van, and Millie, my collie companion, along with me. “After a week I had a sketchbook jumble of thoughts, sights, sounds even smells and tastes. 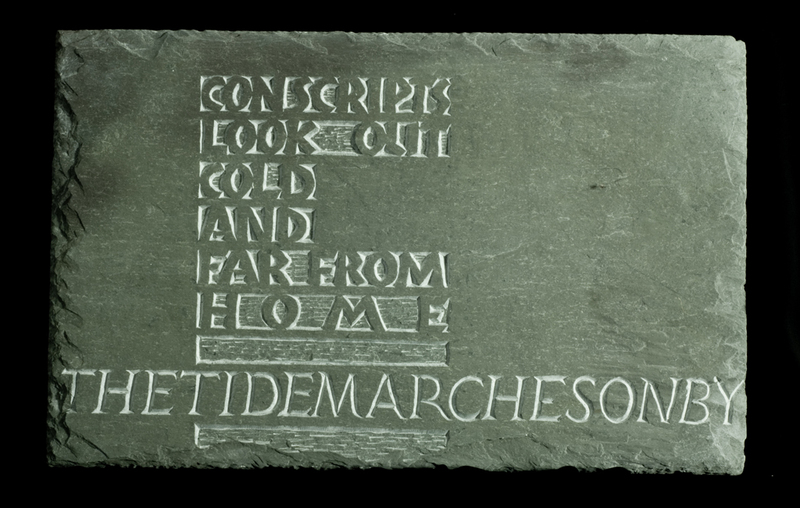 Since then I’ve been working to translate these and the end result is to be a series of 8 woven pieces using a common ‘cartoon’ and with corresponding haikus carved in green slate. “As the ‘better’ weather has come, the long labour which production of tapestry (and to a lesser extent stone carving) demands has been keeping me indoors against my will. So, I’ve found way to secure a weaving frame in the back of my van and have a portable stone-easel. I’m now continuing work back overlooking Hoy Sound. Apart from being a shameless excuse to spending long hours round the shore (Millie offers no such apology), I begin to wonder if there are more possibilities for working directly from life than I had thought possible in such slow media. “So with any luck, come the Science Festival, the results of my week’s observation and summer’s weaving and chipping will be on the walls at Northlight. 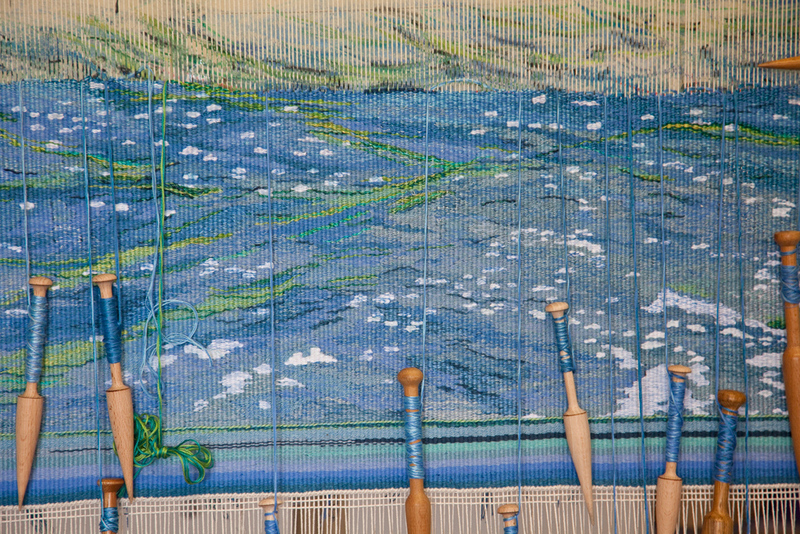 Along with them will be a larger tapestry depicting the movement of tidal streams around Orkney. Woven over an 18 month period the piece was an expression of thoughts about the ever increasing ‘renewables’ activities in Orkney waters. 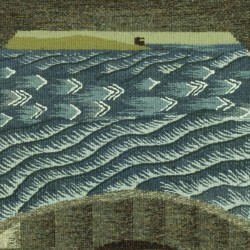 Alongside will be work by Janet Clark which has all the freshness and excitement of a visitor to Orkney. My inspiration at the moment is the Orkney seas, their moods, colour, movement and endless beauty. I use traditional methods of tapestry ‘Flatweave’, using cotton, wool, linen, silk and viscose to express my design work. I learnt to weave 17 years ago in Hebden Bridge at an evening class run by Sue Lawty, an Artist Weaver. I continued to weave over the years, attending many workshops to learn more and improve as much as possible. I have taken part in exhibitions since 1997, these have included the American Tapestry Alliance, Stables Gallery in Twickenham, the British Tapestry Group Exhibitions, HOST in Huddersfield, Holmfirth Fringe Open Studios and now with Ros in Northlight, Stromness. I am a member of Lateral in Yorkshire and exhibit annually with them. Lateral is a group of like-minded artists, a rope sculptor, glass sculptor, weaver and textile artists, who came together wanting to share exhibitions, meet up, learn and share experiences. We have been exhibiting together for four or five years now, gaining more renown and success. 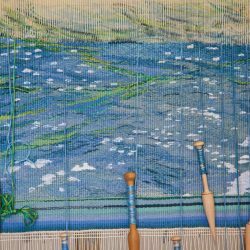 Over the years I have moved on to weave larger pieces on my non-mechanical, vertical, large tubular steel loom – larger means I am better able to express my feelings and designs. I have made several visits to Orkney, taught and studied, drawn by the archaeology, landscapes and Islands. My inspiration comes from the seas, the colours, moods and movement of the waves, deserted beaches and feelings of serenity and happiness when I walk on them. I will be spending a week on Westray over the summer with a group of artists, exploring the island and our art work. Sheer heaven! The exhibition ‘Between Tides – sea watching in weave and stone’ by Ros Bryant and Janet Clark was shown at the Northlight Gallery in Graham Place, Stromness, during the 2013 Orkney International Science Festival. Janet Clark has been a tapestry hand weaver for many years, and is moving on now to spreading the word and hoping to encourage many more people to take on the rich and vibrant skill of tapestry hand weaving. She says that it is a rich and vibrant medium open to a great deal of interpretation of a subject. ‘It is Slow Art, contemplative, soothing and very expressive.’ Further examples of her work can be seen on her website.